Now that our first summer in New York has passed, and I have moved the overly sensitive, creepy, talking smoke detector into the lounge room(!) I can finally use my oven again. I’m actually glad to have some extra heat and delicious aromas wafting around the apartment from the kitchen. I have been loving the enthusiasm with which the Americans celebrate Fall, the leaves are changing and there’s such a warm, festive feeling from every shop window to people’s backyards. Purple is definitely an Autumn color, and rightly so, because aubergine is also in season in Autumn. 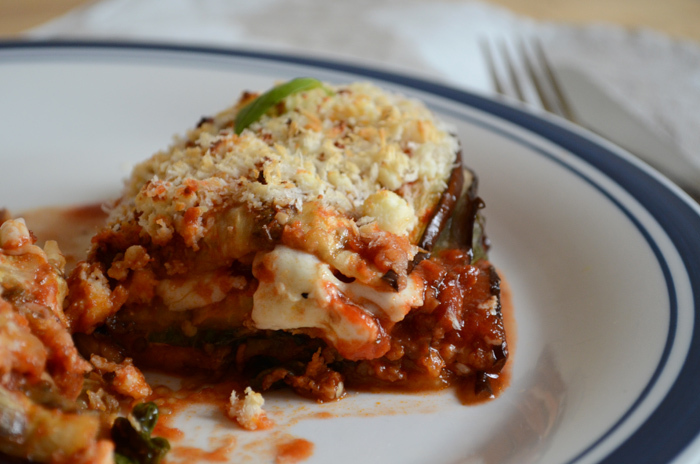 And what better way to celebrate the humble eggplant than by pairing it with other tasty, hearty things. The Italian deli across the street from our apartment makes fresh mozzarella by the hour — and it’s really lovely. This could easily be a delicious vegetarian dish if you replace the chorizo with olives or mushrooms, or both! The cheeses are a key element in this dish, and whilst I think most types of cheese would work brilliantly in this, a mozzarella is a must. Prepare the ingredients for the sauce. 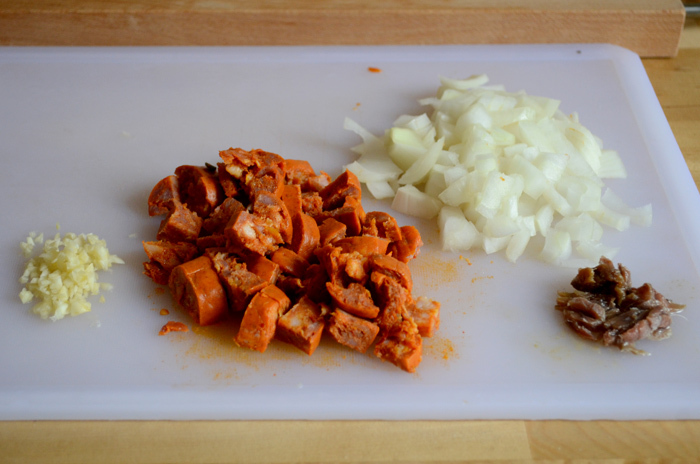 Mince the garlic and anchovies, roughly chop the onions and cut the chorizo into chunks. 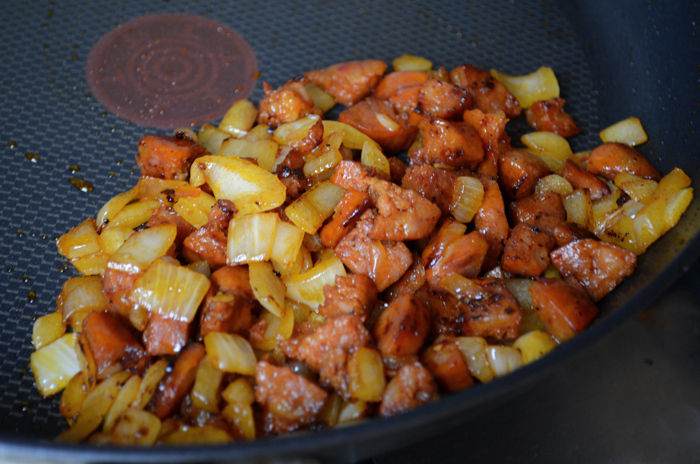 Sauté the chorizo and onion in a pan until caramelized. Drain any excess oil and set aside. Sauté the garlic in 1 tbsp of olive oil in a small pot. 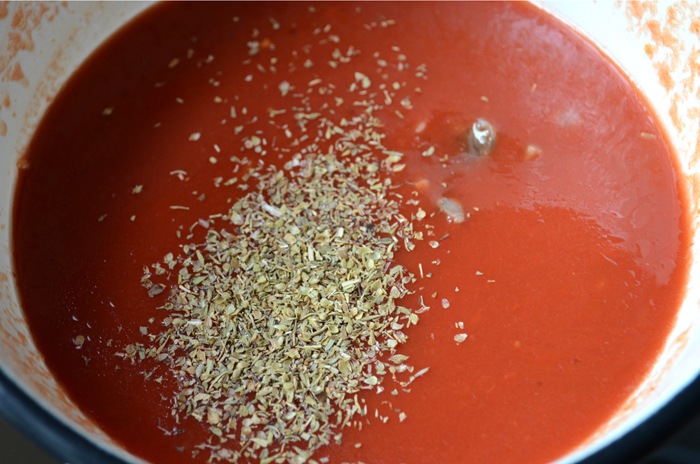 Add tomato purée, water, oregano, a pinch of pepper and the smallest amount of salt. Leave the sauce to simmer until it reduces to a nice thick sauce. 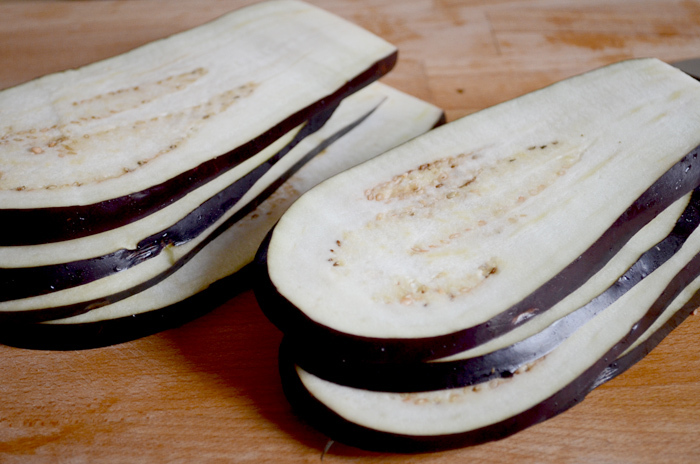 Slice the eggplant into 5mm thick slices. 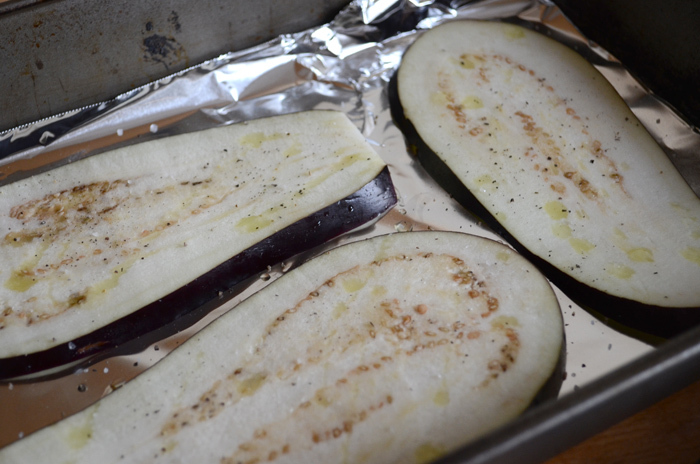 Line a baking tray with aluminum foil, and place the eggplant slices so they don’t overlap. Drizzle some olive oil and season with a little salt and pepper. 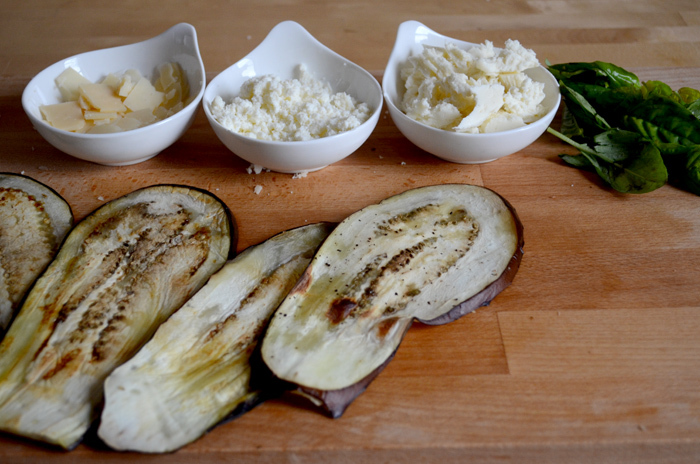 Place the eggplant under the grill for 5–10 minutes on both sides. 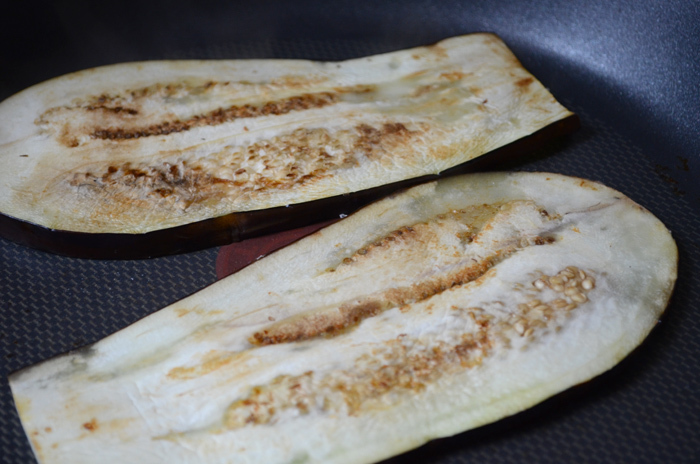 I cooked some eggplant on the pan as well to speed things up. They should be on very low heat and the flesh should start to look a little wrinkly and cooked before you flip them over. 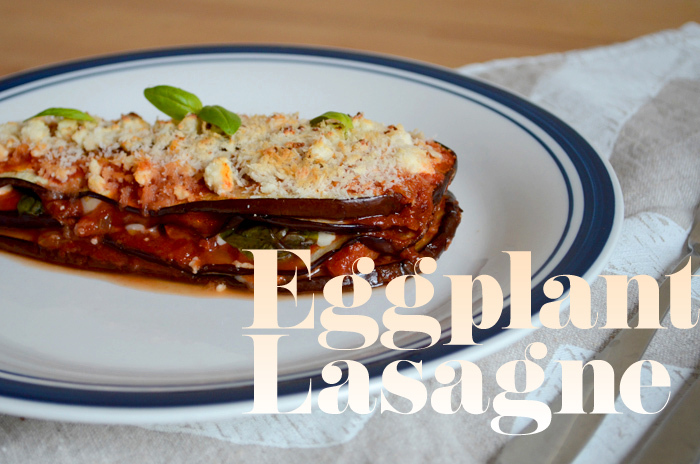 While the eggplant is cooking, prepare the other parts of the lasagne. Shave the Asiago, crumble the fetta and tear up the mozzarella into chunks. 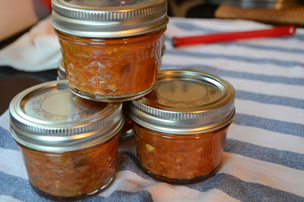 Finish off the sauce by adding the chorizo and onions to the sauce and cooking it for a few minutes. 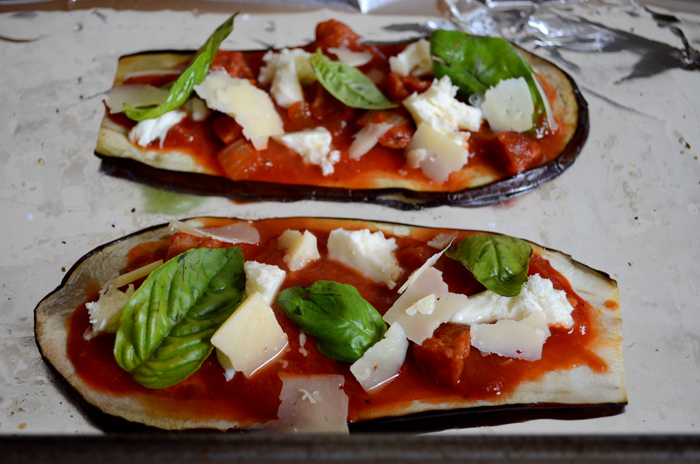 Assemble the lasagne by layering the eggplant, tomato sauce, three cheeses and basil leaves. 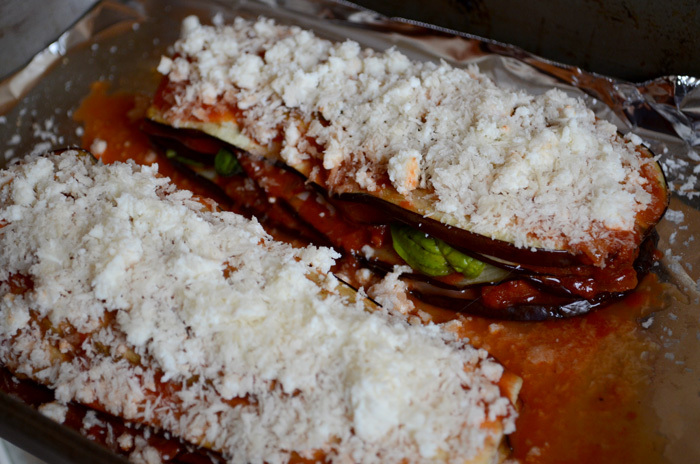 Repeat three times and after the last layer, place some sauce and crumble cheese and bread crumbs on the top. Bake under the grill for 10 minutes, or until the bread crumbs are slightly browned. 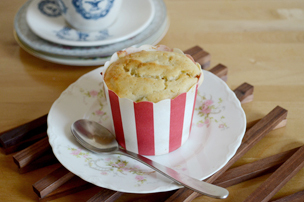 One gratuitious yummy shot of the oozy insides.